Technology instructions for the McCormick Lab in the High Library. If you experience any problems, call ext. 3333 or e-mail the Help Desk at mediaservices@etown.edu. Please visit our web site at http://www.etown.edu/ITS for additional information. Step 1:Press the touch panel and then touch the blue light bulb button. The projector will come on and the screen will come down. 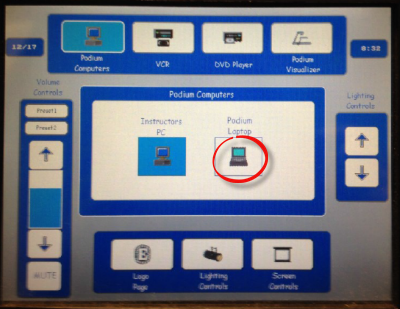 Step 2:Press the Instructors PC button. Step 3:The computer is located inside the cabinet to the right. Press the Power button located on the front of the computer and monitor if not already on. Log on with your network username and password. The computer image will appear on the projection screen. Step 4:Lights and sound may be controlled by the touch panel. Step 5:Make sure the mute button is not turned on. Warning: Computer resets upon restart and shut down. Save your files to the network of removable media only. 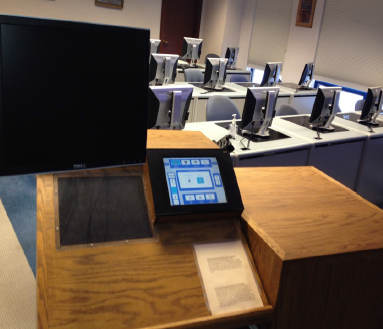 Step 1:The document camera is in the drawer to the right of the podium. Step 2:Press Podium Visualizer to project the document camera. Step 3:Make sure the document camera is on and in position. The power switch is on the left hand side of the base. The release is found at the bottom of the camera arm. Step 4:Use the buttons on the touch screen to adjust the view of your objects. Step 2:The VCR/DVD player is located in the cabinet below to the right. Press the Power button on the silver VCR/DVD player to turn it on. 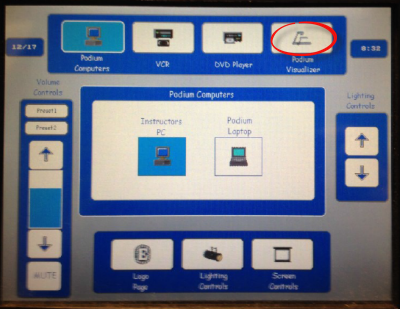 Step 3:Press the DVD or VCR button on the touch panel. 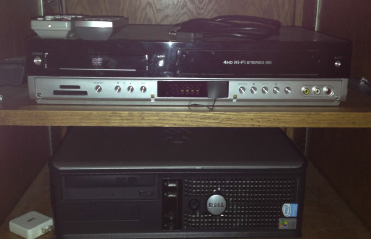 Step 4:Place either a VHS tape in the left or a DVD in the right side of the VCR/DVD player. Step 1:Begin with the laptop turned off to connect. 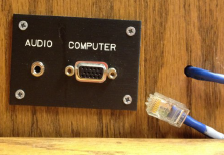 Step 2:Connect the VGA cable to the Computer port and the Ethernet cable to the network jack on your laptop. Audio will also need to be plugged in if you need sound. The laptop connections are on the side of the podium. Step 3:Turn on the laptop. If you need power, plug your power adapter into the outlet. Step 4:Press Podium Laptop on the touch screen. Step 1:Turn off the projector by shutting down the system. You need to press the Elizabethtown "E" button on the bottom of the screen. You will be prompted by a message on the screen to shut the system down. 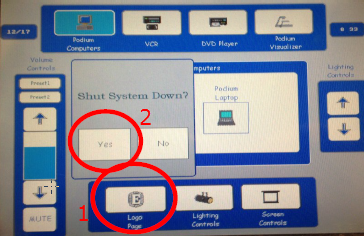 Press Yes and the system will shut down. Step 2:Make sure the screen goes up and the projector turns off. Step 3:If you want to turn on the projector again, give the machine several minutes to cool down before restarting the projector.